Otis T. Mason : Primitive Watercraft, 1902. W. Scott Ltd, London, Charles Scribner's Sons, New York, 1902. A brief overview of primitive watercraft, noted by Hornell (1946) page 3. Locomotion must necessarily have been largely by water at first. It was the reproach of the Choctaws living on the Mississippi river that they could not swim, but it would be very difficult to find another tribe of savages devoid of this art. The Labrador Indians use little paddles to drag themselves quickly through the water. The tribes on the borders of Mexico, in Peru, and in several localities in the Eastern Continent, tie bundles of reeds together as floats. The ancient Assyrians are represented as buoying themselves upon inflated goatskins. Cardinal Wolsey confessed that he had ventured, like wanton boys who swim on bladders, far beyond his depth. pride was true, no doubt, but the bladders used as life preservers by boys and men are difficult to burst. On the Gulf of California there are tribes that lash two light bits of wood to a vine which they place against the breasts, exactly after the manner of the cork life-preservers. Even the eastern Eskimo at times ride on the seal- skin harpoon floats. Except in the matter of flying, the savage man solved the difficulty of going where he pleased. In surf swimming they used a small board, on which they were accustomed to ride inward on the breakers. In the sport called pakaka- nalu, the player rides the surf sitting in his canoe. 1. 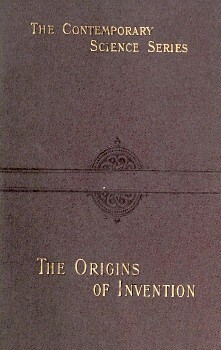 Consult Col. Lane Fox, "Early Modes of Navigation,"
Journal of the Anthropolgical Institute, London, 1875, Volume IV, pages 399-437. 2. See " The Long Voyages of the Ancient Hawaiians,"
Hawaiian Historical Society, May 18, 1893. 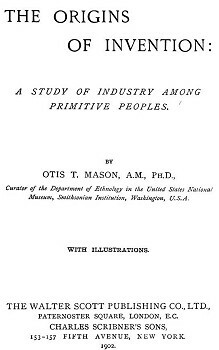 Geoff Cater (2013) : Otis T. Mason : Primitive Watercraft, 1902.